Thank you for rejoining this week for the continuation of our series, “Bed Bugs in Institutions”. Last week, in the first installment of this series, you learned that, in recent years, there has been a large increase of bed bug populations in healthcare institutions. You learned that the origin of bed bugs is largely unknown, but that after World War II, these bugs decreased in numbers in a significant manner. It was not until the late 1990s that these pests started showing up in large numbers in homes, healthcare institutions, and other types of buildings and areas where people populate. You have also learned that these insects are considered to be a nuisance because of their feeding habits. Additionally, you learned that the heat treatments that we offer here at All Pest Exterminating Inc. are the absolute best method to quickly and safely eliminating bed bugs. This week, we will expound on further health issues associated with large infestations and the dangers of using insecticides. 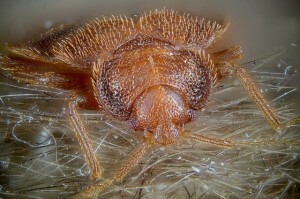 Throughout history, many people that have severe infestations of bed bugs within their home have had to seek medical treatment as a result of being bitten by the insects and exposure to the pests. The two most serious complications that have been notably associated with bed bug infestations are the development of anemia and the onset of asthma. Anemia may develop because of the blood loss that may occur with bed bug bites. Asthma has been known to occur in those that suffer an allergic reaction to bed bug infestations and/or bites. Each of these conditions could result in severe discomfort and the onset of further health complications. When people are residing in healthcare institutions, the proper care must be taken to ensure that infestations are completely eliminated. If these care steps are not taken, the health of the individuals subjected to these pests may get worse. Now, we know that bed bugs are a nuisance and that they may result in the physical health complications of anemia and asthma; however, it is also important to know and understand that the use of insecticides may prove to be very harmful to those in healthcare institutions. Many individuals that are subjected to these chemicals may have short-term issues such as headaches, nausea, and vomiting. Then, there are situations where it has been found that insecticides have led to long-term health issues. These include reproductive health problems, disruption of the endocrine system, and the development of cancer. To have bed bugs poses many dangers and risks to patients and staff in healthcare institutions. To treat bed bug infestations with basic insecticides also poses many dangers and risks to patients and staff. What, then, is the best approach to combatting those nasty bed bug infestations? Heat treatments! These types of treatments are not only the absolute best type of treatments for getting rid of bed bugs, but, they are the most effective and the safest. Additionally, the heat from these bed bug treatments has been found to kill off other pests in the institutions and completely sanitize surfaces. If you own, operate, and/or manage a healthcare institution, click HERE now to learn about this revolutionary bed bug treatment.